A pampered dog is internet-famous after her owner was forced to fork out for a ‘dog ticket’ on the bus. Heidi Lewis initially thought the driver was joking when she took the number 27 in Merthyr Tydfil, Wales, last Thursday and was made to pay 90p for her tiny French Bulldog Chanel. However the six-month-old puppy was determined to get her money’s worth and hopped up onto her own seat next to Heidi. 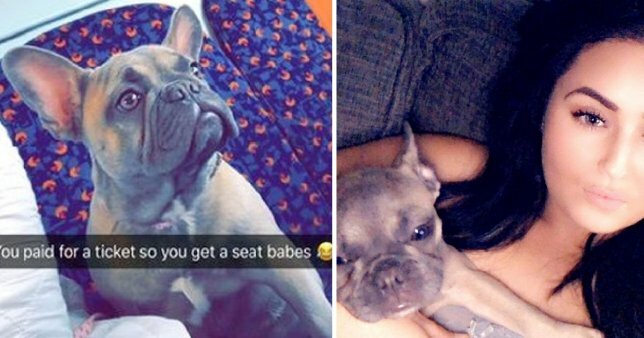 A hilarious photo of Chanel relaxing on the seat next to a picture of the dog’s ticket with the comment ‘you paid for a ticket so you get a seat, babes’ quickly went viral, with more than 40,000 shares and likes. Heidi, a 26-year-old mum-of-three, says this is the first time she’s ever been asked to pay for a ticket for Chanel – and questions why dogs are charged when babies go free.